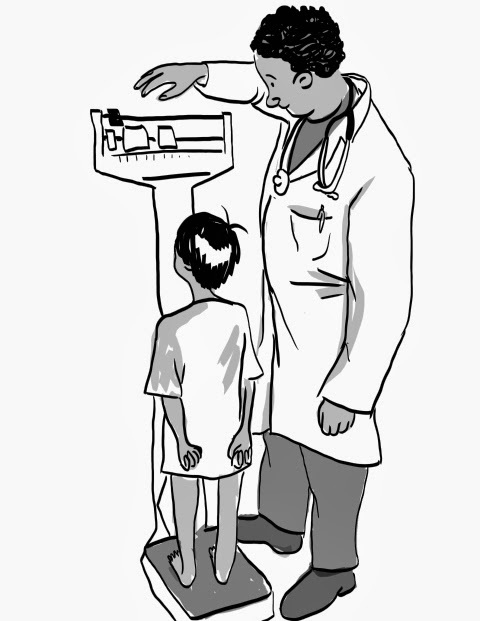 Weighty Matters: Does Your Doctor Know How To Weigh Your Child? I'm Betting Many Don't. Does Your Doctor Know How To Weigh Your Child? I'm Betting Many Don't. As has been my tradition, in December I repost old favourites from years gone by. This year am looking back to 2014. On the surface it doesn't sound all that difficult. Ask child to stand on scale. Weigh. Record weight. Done. Working with parents of children with obesity, it seems many doctors nowadays feel it's important to add in some judgement or scary statistics such that after 'weigh' and before 'done' comes a speech on the dangers of weight along with the implicit or explicit suggestion that the child is responsible - either for gaining the weight or for not losing it. I don't think that's fair. Moreover, I don't think it's helpful and I think it may well do harm. It's not fair, especially with younger children, given that they're not in charge. They don't do the grocery shopping. They don't cook the meals. They don't set the example. They live the lives their parents teach them to live. They're life's passengers, not the drivers. It's not helpful because speeches or stats without action plans by definition aren't helpful. It's potentially harmful because the negative emotions bound to be generated by this sort of an interaction may well erode a child's self-esteem, body image, and their relationship with food. It may also lead that child's parents to adopt a knee-jerk pattern of restriction, guilt and shame that is far more likely to make matters worse than better. The safest way for a physician to weigh a child is to tell the truth as to why weights are important. The truth is that children need to be weighed because medication is dosed dependent on a child's weight and therefore physicians need to have fairly current weights on their growing patients in case they fall ill and require a prescription. And should a physician have a concern about a child's weight I'd encourage them to have a discussion with that child's parents with the child absent and clearly, there's not much point even having the discussion unless that physician has suggestions or resources beyond the tritely useless truism of "eat less, move more".